Pakistan Television (PTV) is attempting to rope in two big name anchors and has offered them tempting salary packages. 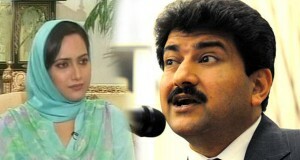 It has learnt that the management plans to hire popular talk show host Hamid Mir of Geo TV and Asma Shirazi from Samaa. Insiders say that Hamid, who hosts the program Capital Talk is being offered Rs 3 million per month. Hamid is currently serving Geo as Bureau Chief and Editor (North) and is said to be negotiating with the PTV management on the package. The PTV is also in contact with Asma offering her a contract that could earn her Rs 1 million per month. Asma quit ARY TV last year and moved to Samaa where she hosts an outdoor talk show. There are also reports of negotiations being held with Geo’s Sohail Warraich of Aik Din Geo Kay Saath. There is resentment among the employees over such expensive signings. The PTV workers union held a general body meeting the other day to protest. Back in 2008 Dr Shahid Masood who hosted Meray Mutabiq on Geo was appointed the Managing Director of PTV. During his time at PTV, he produced the first ever independent audit report on corruption in the office, for which he came under fire from the information minister and subsequently offered his resignation. Dr Shahid refused to back down from his stance on the audit report; after meeting with the prime minister he tendered his resignation and was appointed special advisor to the prime minister but after a few days he resigned from that office as well. He rejoined Geo from where he was forced to beat a retreat to his old channel, ARY. He is currently with Sadruddin Hashwani’s new media group as its President and Chief Executive Officer. Veena – Accident or Attack ?